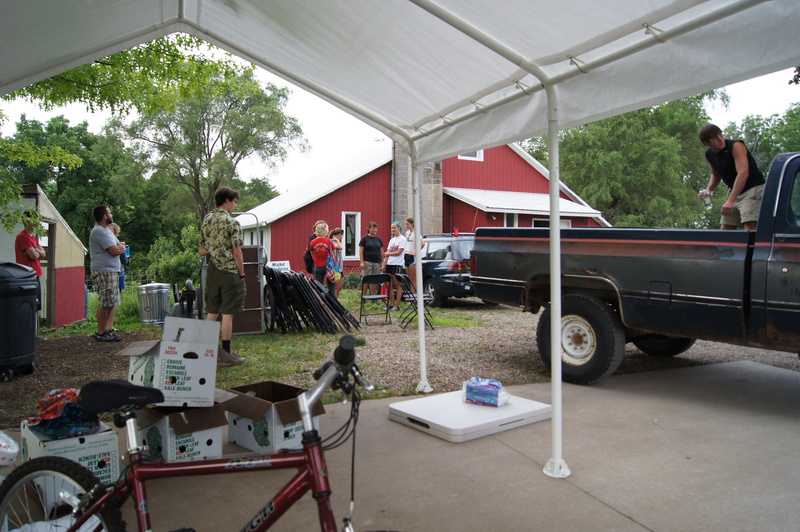 Months having passed since then, I still have a fantastically vivid memory of travelling up to nearby Solon, Iowa, to volunteer at Wild Woods Farm, from which we were receiving an amazing CSA share each week for group cooking. Another not quite so vivid memory (but fantastic all the same) of sprawling out across cushions watching Food Inc. with the group in a state of post giant delicious CSA meal stupor; some dozed, others snored. A Twitter post from the ICSOS account earlier that week showed my fellow 2013 program leader, whom we affectionately call “Nerk,” face-down on the floor with the caption “humidity and hard work strikes again.” We farmed, we gardened, we painted, we created, we canvassed, we did our best to make the world a better place. We had a whole lot of fun. A glimpse into my day at Wild Woods Farm in Solon, Iowa. 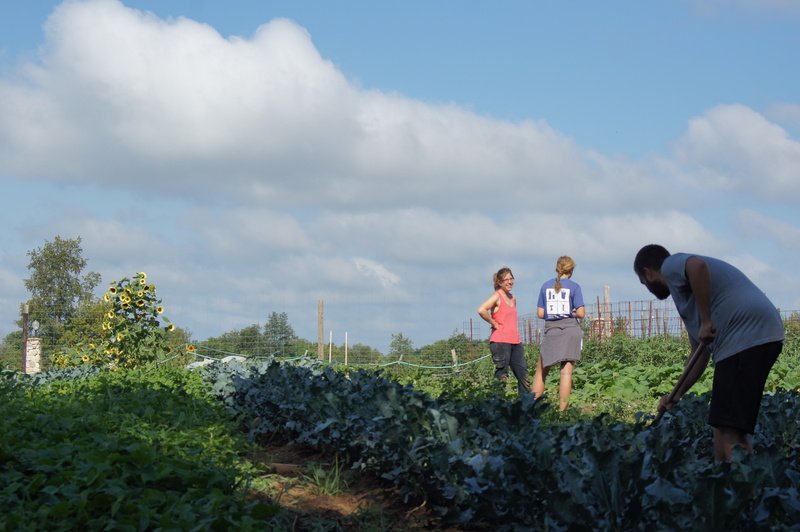 2012 Program Leader Tom Frakes hard at work in the temporarily shady section of the farm. On somewhat of a side note, one issue that I personally would like to focus on in the future is agriculture. Oddly enough I found myself at Menard’s recently and, adjacent to the checkout line, sat a stack of boxes of popsicles, their main ingredient being corn syrup. Corn had been grown on a massive, single-crop farm, likely from genetically modified seeds, sprayed with pesticides that are polluting the Mississippi and creating dead zones in the Gulf of Mexico (as the Des Moines Register reported somewhat recently), and then harvested, shipped to factories, processed into syrup, shipped again to yet another factory, and made into these popsicles that confronted me at the checkout. All this energy put into creating a product that only harms people in return, not to mention all the harm done in its creation. It’s quite the conundrum that sorely needs our immediate attention. That’s what has been gnawing at me, and driving me, most recently. Hats off to Practical Farmers of Iowa for the work they’re doing related to this. This year is but a mere three (and three-quarters) days young as I write this, and yet it already is brimming with promise. Before I delve into my thoughts on that, however, I feel I must further write of the drive, and the sources there within. Extreme weather events, Hurricane Sandy on the east coast of the United States and Typhoon Bopha in the Philippines to name a few, have brought climate change into the limelight. In one of my favorite modern motivational quotes, Jim Yong Kim, the president of the World Bank, said: “We will never end poverty if we don’t tackle climate change. It is one of the single biggest challenges to social justice today.” Additionally, as a recent New Yorker article attests, community building is much needed in a climate change fury fraught future (Chicago solutionaries you may just be alluded to in said article!). I look to all these things for motivation to do the work we do locally with Iowa City Summer of Solutions, and nationally (now even globally (sort of). A hooray and a warm welcome for the Sofia, Bulgaria program!) with Grand Aspirations. On to the future! What I aspire to is what we have done and cannot wait to do again. We will go door to door trying to save folks money on their energy bills and reduce energy usage in the process, we will push for sustainable business practices in the community, we will help spread the solutionary word at summer camps, we will repurpose waste into art and encourage local artists to do the same, we will grow fruits and veggies, and build compost bins, and a solutionary community. Here’s to what lies ahead (including the January Gathering in Chicago, I’m incredibly excited!) and may all your Grand(est) Aspirations come true! Stay solutionary, friends. I don’t know that I can say much that hasn’t been said by my colleague here, except tell my own story. So, I’ll do that. I heard about Summer of Solutions through a friend of mine at school. She’d been involved with the program the year before and she was working to recruit members. I thought it sounded like the kind of work I’d be interested in, and I decided to apply. I got a response, including a date and a place in downtown Iowa City where we would start. I was excited to start. Little did I know, my excitement would only grow as I worked with this group. When I arrived, I was thrilled to find an old friend of mine. She directed me to the basement of this church, where I found a handful of affable (though clearly busy) college students, a circle of chairs and one or two other folks who looked as confused and awkward as I felt. I shuffled in and sat down. However, this awkwardness soon evaporated. As more participants filed in, a general buzz materialized, and the silence was broken. Those busy college students turned out to be the guys in charge, and as they finished up their business, they sat with us and casually answered some of the questions we had. Eventually, we started and I saw how truly extraordinary this group was about to become. The thing that I found most exceptional was the openness that was fostered in the first few days, even hours, of the program. From the very beginning, everyone was willing to be honest, and share some important things about themselves. Starting with some goofy get-to-know-you games, we became increasingly friendly and familiar with each other, until, at the end of the week, we were able to share a deeply personal experience without batting an eye. The experience was an exercise called the Identity Walk, and it helped us learn about ourselves and each other. Nick “Nerk” Gerken (Hawaiian shirt, third from left) and much of the Iowa City solutionary crew at Friendly Farm in Iowa City, Iowa on one of our first volunteer Fridays of 2012. This openness, this ability and willingness to share (and to cooperate, as the program went on) was incredible. It made our relationships effective and our friendships meaningful. I really value substantial relationships, and the hope that I can build more and help others build them this summer gives me warmth and cheer on this cold and lonely January day. This entry was posted in Local Programs, Summer of Solutions and tagged 2013, Eli, Gerken, Grand Aspirations, IA, ICSOS, Iowa, iowa city, Local, Nick, Shepherd, solutionary, Stories, Summer of Solutions by Eli. Bookmark the permalink.